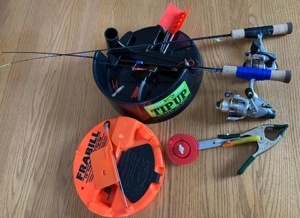 Lots of options when it comes to set-lines; rattle reels, tip-ups, a jig under a bobber, an IFish Pro, and more. In clear water I prefer longer fluorocarbon leaders to eliminate line shyness. When it comes to hooks you have lots of options. Try different colors, sizes, octopus hooks, treble hooks, circle hooks, weighted hooks, or spoons. 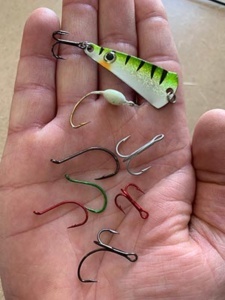 Some of hooks that use on set-lines depending on the type of bait and the bite. That’s a lot of variables when it comes to set-lines, and you also have your jigging rod to think about. I will talk more about dialing in your jigging technique next week.